What happened to Wilmer and Edna Kearns and the “Spirit of 1776” suffrage wagon after the passage and ratification of the 19th Amendment in 1920? They moved from Rockville Centre, NY with daughter Serena Kearns back to Pennsylvania where their second child, Wilma, was born in November 1920. The New York Botanical Garden (the LuEsther T. Mertz Library) has archival materials in its collection from the business Edna and Wilmer founded, Echo Dale Gardens, located in the Philadelphia area. More items have been added recently. The Mertz Library maintains a wide scope of materials related to the nursery industry in the United States, including correspondence between nursery owners and their customers, invoices, plant inventories, sales brochures, catalogs, newspaper and magazine articles. 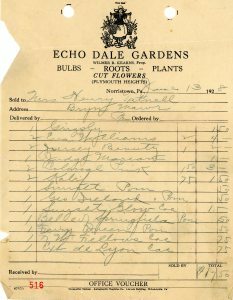 Edna B. Kearns and Wilmer R. Kearns’ love of plants and nature led to the establishment of Echo Dale Gardens, the nursery they owned and operated together after 1920. Wilmer and Edna were active in the Pennsylvania Horticultural Society, and their prize-winning flowers and plants were displayed each year at the Philadelphia Flower Show. Local newspapers document Edna’s public speaking about gardening in the Philadelphia area. The “Spirit of 1776” suffrage campaign wagon was on display at the nursery for many years for the purpose of educating the public about how American women won the vote. Their second child Wilma dressed as the little Dutch girl, the trademark for Echo Dale Gardens for special events and at the Philadelphia Flower Show. After Edna’s death in 1934, Wilmer continued operating the nursery at Echo Dale until World War II. In retirement he reopened the nursery in Ambler, PA. The overall collections at the New York Botanical Garden library also include plant information guides, nursery catalogs, exhibition guides, and other materials. Follow the Suffrage Wagon for news and views of the movement, as well as the life and times of Edna Kearns, Wilmer Kearns, and the “Spirit of 1776” suffrage wagon.